Madrid Subterra has opened the first call for Ideas and Projects for Exploration and Exploitation of Underground Urban. The deadline for all proposals is Monday 31st August 2015. 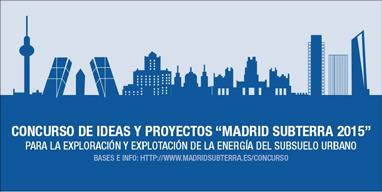 Application forms will be submitted through this website www.madridsubterra.es/concurso. This call is opened for all works, ideas and projects of materials, technologies, devices and systems related to the energy of urban underground: geothermal energy; energy recovery of distribution networks; energy recovery of transport infrastructure, structural systems and heating systems and district cooling, amongst others.